Synthetic peptide corresponding to Human CIKS/ACT1 aa 554-568. Our Abpromise guarantee covers the use of ab5973 in the following tested applications. ICC/IF Use a concentration of 20 µg/ml. IHC-P Use a concentration of 5 µg/ml. WB Use a concentration of 0.5 - 1 µg/ml. Detects a band of approximately 63 kDa (predicted molecular weight: 65 kDa).Can be blocked with CIKS/ACT1 peptide (ab6089). Could be involved in the activation of both NF-kappa-B via a NF-kappa-B inhibitor kinase (IKK)-dependent mechanism and stress-activated protein kinase (SAPK)/JNK. Western blot analysis of CIKS/ACT1 expression in human placenta tissue lysate with ab5973 at 1 µg /ml. Western blot analysis of CIKS/ACT1 expression in human placenta tissue lysate with ab5973 at 1 µg /ml. ab5973 at 5µg/ml satining CIKS/ACT1 human lung tissue by IHC. 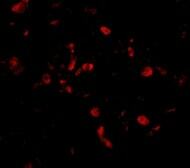 Immunofluorescence of CIKS/ACT1 in Human Lung cells using ab5973 at 20 ug/ml. ab5973 has not yet been referenced specifically in any publications. Publishing research using ab5973? Please let us know so that we can cite the reference in this datasheet. There are currently no Customer reviews or Questions for ab5973.